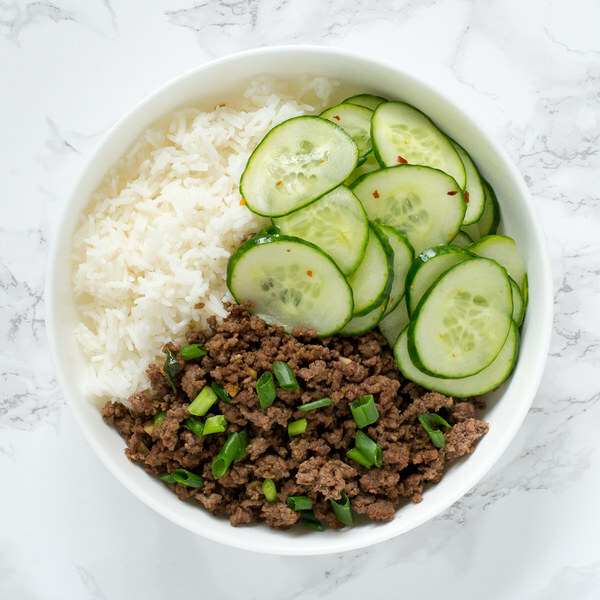 ← Korean-Style Beef Rice Bowl with Cucumbers. Using a strainer or colander, rinse the rice under cold, running water, then drain and transfer to a small saucepan. Add water to the saucepan; bring the mixture to a boil over high heat. In a large salad bowl, combine and whisk together rice vinegar, honey, and crushed red pepper. Trim off and discard the ends of the cucumbers; slice the cucumbers crosswise into very thin rounds. Add to the salad bowl and toss. Peel and grate or mince the ginger. Transfer to a small bowl. Trim off and discard the root ends of the garlic; peel and mince or press the garlic. Add to the bowl with the ginger. To the ginger and garlic, add soy sauce, sesame oil, and honey. Preheat a nonstick skillet over medium-high heat. Trim off and discard the ends of the green onions; cut the onions crosswise into ¼-inch pieces at an angle. Transfer to a small bowl. Once the skillet is hot, add the ground beef to the skillet; cook, breaking apart with a spoon, until browned and crumbly, 3 to 4 minutes. Add the soy sauce mixture and about ¾ of the green onions (save the rest for garnishing) to the beef; stir to combine and cook for an additional 1 to 2 minutes. To serve, divide the rice, beef, and cucumbers between plates; garnish with the remaining green onions and chili-garlic sauce. Enjoy!